He was the winner of the Karol Szymanowski- and Rodolfo Lipizer Competitions and was a laureate at another renowned international competitions (Spohr, Montreal). His concert activities have taken him around the world and he has made numerous recordings for radio, television and CD.His broad repertoire also features works by Lutoslawski, Ligeti, Nono, Schnittke, Pärt and Penderecki. 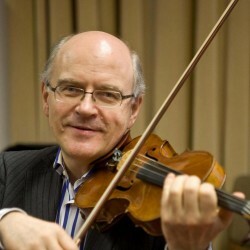 Krzysztof Wegrzyn served as concertmaster of the Hanover State Opera and Philharmonic Orchestra for many years and since 1993 has been a professor of violin at the University of Music, Drama and Media Hanover and since 2012 its Vice President. Many of his students have won top prizes in major international competitions and have become members of leading European orchestras. Krzysztof Wegrzyn regularly holds master classes worldwide including at the Holland Music Sessions and the Conservatories in Geneva, Lausanne, Madrid, Florenz, New York, Beijing, Auckland, Seoul, Shanghai and Tokyo. He has served on the juries of numerous international competitions (e. g. the Tchaikovski, Kreisler, Paganini, ARD, Qingdao, Seoul, Singapore and Sendai). Furthermore, he has also been greatly involved in chamber music and has founded the Ensemble ‘il gioco col suono’. In 2004 he was awarded the State Music Prize and in 2018 the State Cross of Merit.He plays a venezian violin of Domenico Montagnana.